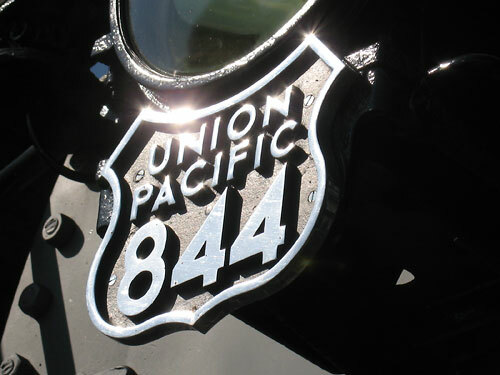 The Union Pacific Steam program is a veritable powerhouse of corporate goodwill that any Public Relations department would love to have. Any live mainline steam out west is likely to happen under the UP Steam shield. 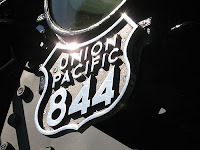 As part of their UP 150 Celebration, Union Pacific sent it's million-pound* ambassador of good will, steam engine 844 down to Texas last month for its UP 150 Express tour. It's return route will come home through Colorado, starting tomorrow. The planned route follows I-25 for most of the way up the Front Range, using the Joint Line. Here's the itinerary from their site, followed by their locations in Google Maps. Saavadre Street Crossing and Larkin Street 11:01 a.m.
County Road 75 Crossing at County Road 71.6 1:15 p.m. 1:45 p.m.
S. Hendren Avenue and W. 5th Street 3:15 p.m.
S. Hendren Avenue and W. 5th Street 8:00 a.m.
Look for signs beginning at access road 11:01 a.m.
400 B Street 8:00 a.m.
112 Pikes Peak Ave. 9:45 a.m. 10:45 a.m.
S. Spruce Mountain Road at S. Perry Park Road 11:45 a.m. 12:01 p.m.
North Yard (no public access) 3:01 p.m.
North Yard (no public access) 8:00 a.m.
Old Depot, 902 7th Ave 12:45 p.m. 1:15 p.m.
UP Steam home 3:01 p.m.